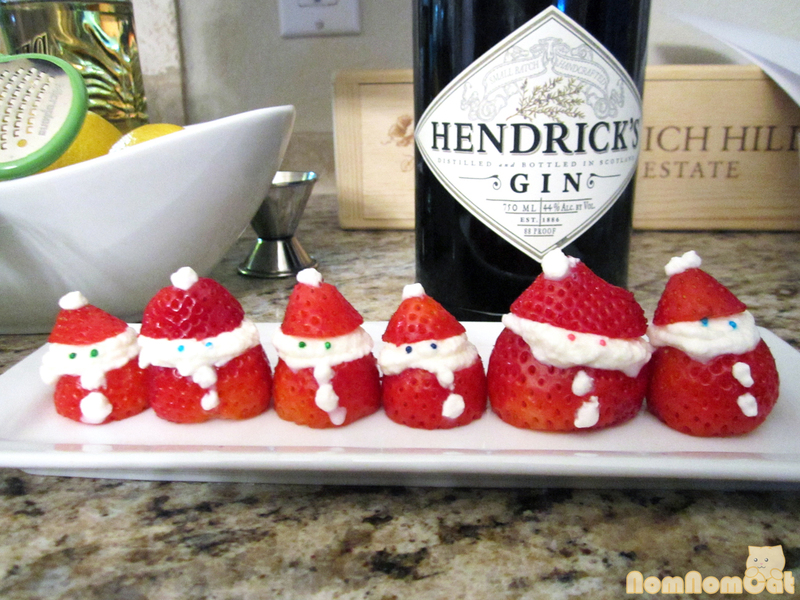 When we saw this adorable picture of anthropomorphized strawberries on Foodbeast.com which credited Claire K as the original creator, we just knew it would be the perfect dessert for a holiday gathering we hosted. 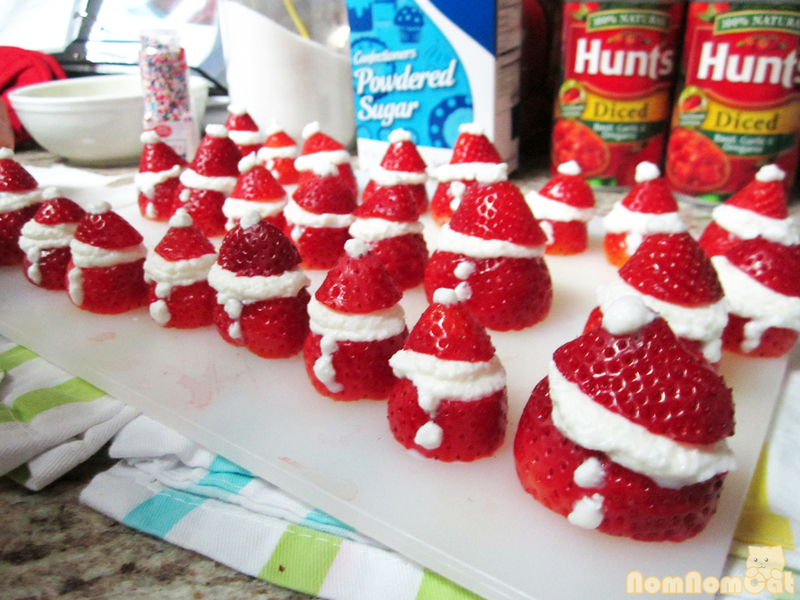 Strawberries are pretty hard to find this time of year, so you can bet that come February, I’ll be whipping up a batch of these and celebrating Christmas all over again! 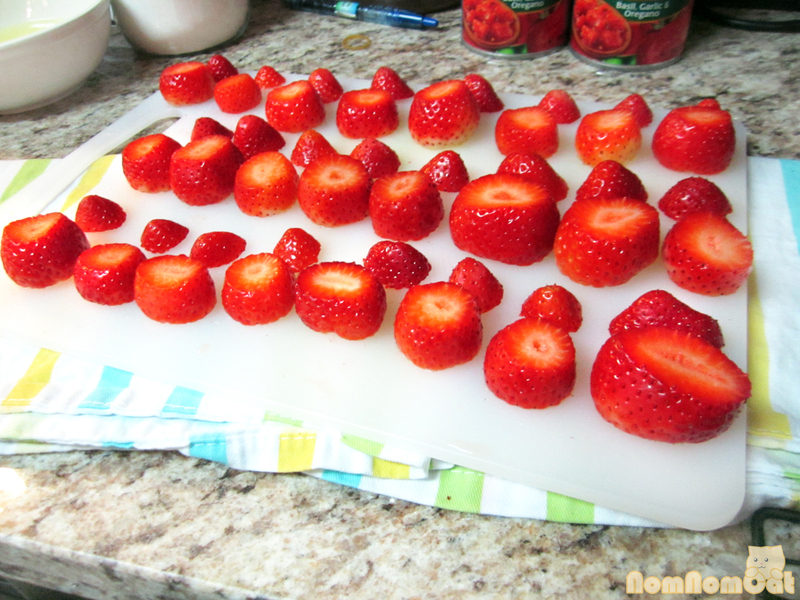 Fear not if your strawberries are not uniform in size. There’s nothing wrong with a snowberry Santa that’s had a few more cookies in his bowl full of jelly than the rest. :] As far as the dish goes, the ingredients are easy, the preparation is quick, and the assembly is intuitive. We had our guests join in on the fun and show off their piping skillz at the party, and it was all a great hit! 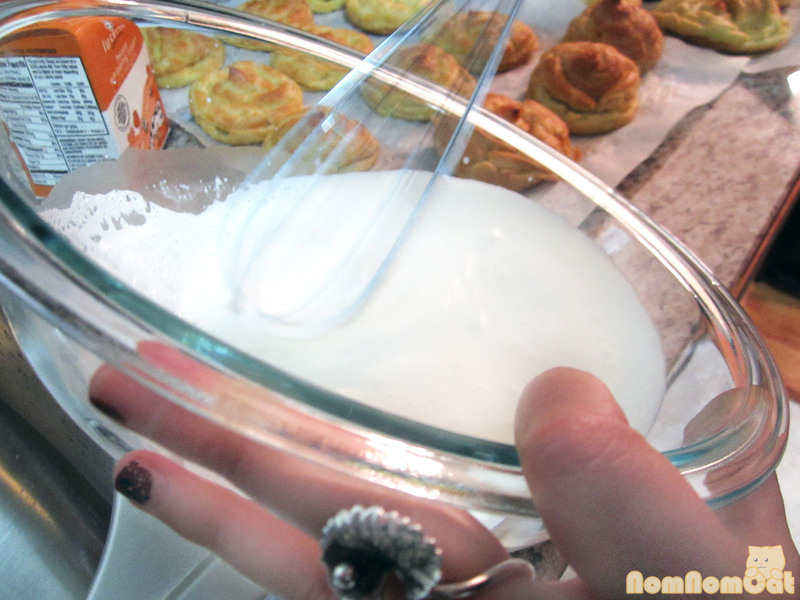 In the chilled bowl, measure out the cream and beat vigorously with a whisk until soft peaks start to form. Add the sugar and vanilla and continue to beat until you end up with medium-to-firm peaks. Be sure not to beat past the firm peak stage or your whipped cream may start to curdle. 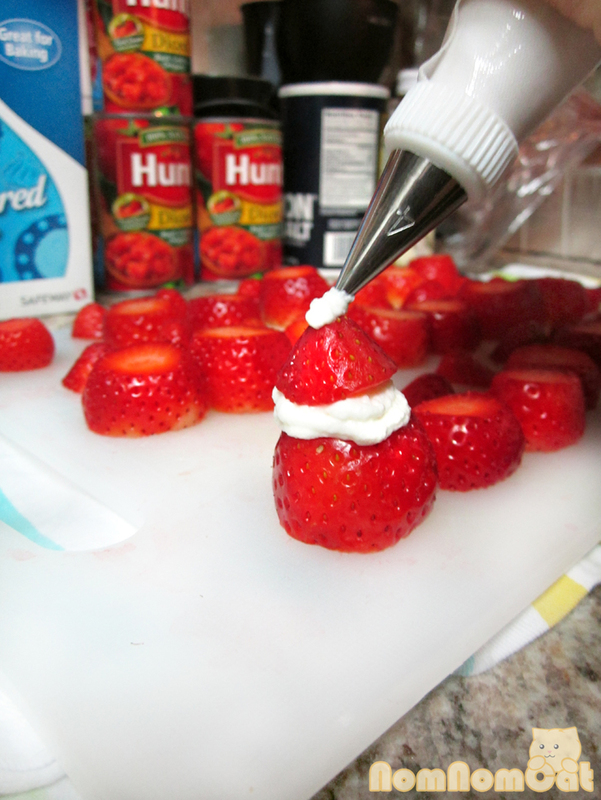 Scoop your beaten whipped cream into a pastry bag equipped with a star piping tip. On your serving dish, line up the bodies. Then pipe enough to cover the exposed cut edge, with a little peeking out for a “face.” Top with the “hat” portion. When all of your Santas have heads, replace the piping tip with a smaller round one. Add details such as the pom pom on the hat and the buttons on the body. Use sprinkles for eyes (the inspiration photo used black sesame seeds). Santa army – the invasion of cuteness! Take many pictures of the Santa army. Sit back as your party guests ooh and ahh and squeal with delight. Bon appétit! 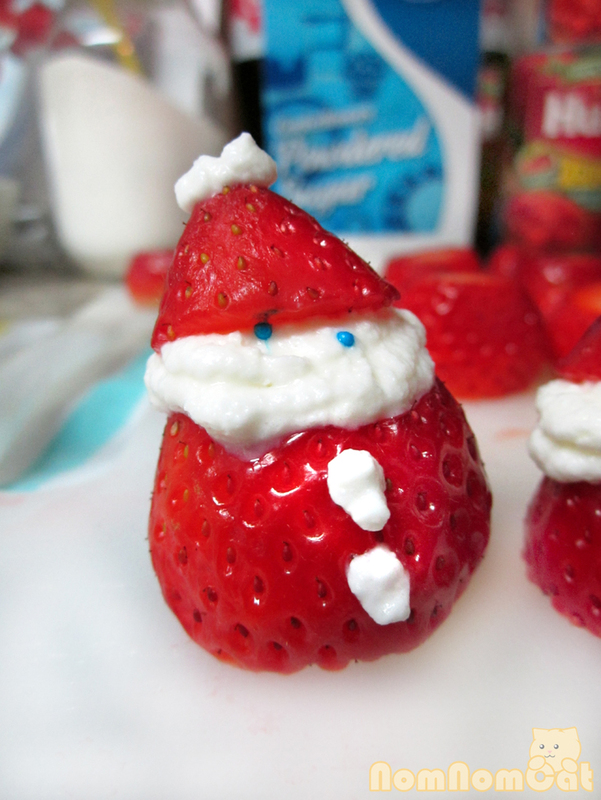 Until strawberry season officially hits southern California, I’ll be brainstorming ways to make Santa Claus appropriate for February (although what’s wrong with substituting this adorable Christmas icon for Cupid?). We hope you all have a wonderful time counting down with your friends and family tonight. Be safe, smile lots, and be merry! May the new year bring great adventures for us all!